A recruitment site for Horizon Teachers – a specialist education recruiter, active in London and the south east. Our design has a couple of neat touches to suit their particular sector – things like their ‘refer a friend’ reward scheme, plus changes to the way job search works depending on when a candidate is looking. Teachers tend to base their search around term dates, so jobs have a ‘preferred start date’ and we’ve adjusted the logic of job search, to match the candidate and job ideal start dates. 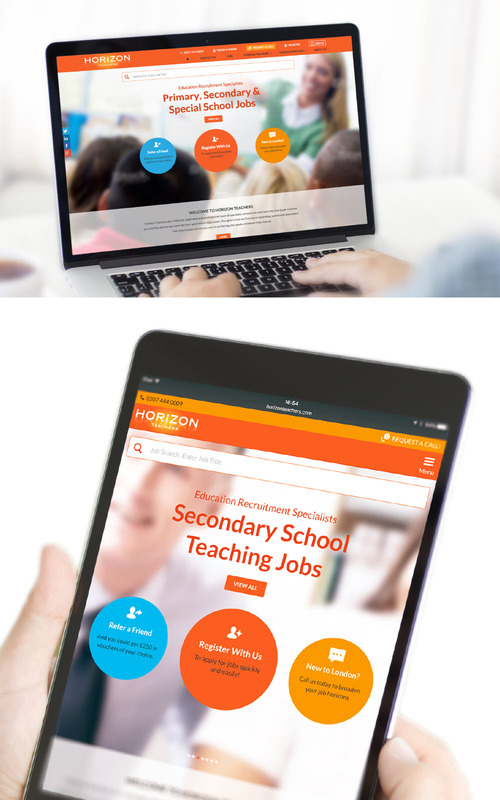 The new site for the first time gives Horizon the ability to maintain their own content and post jobs without a third-party intermediary. The site was a great example of collaborative working – Horizon had a thoughtful approach and suggested some subtle improvements during acceptance testing that made for a site tuned ‘just so’.